David Alechenu Bonaventure Mark, popularly known as David Mark, is a retired Nigerian Army Brigadier General and politician, who belongs to the People’s Democratic Party (PDP). Through the party, he was elected as Senate President and a Senator for the Benue State constituency. Mark was a former Military Governor of Niger State and former Minister of Communication. Born in April 1948 in Zungeru, Niger State, David Mark acquired most of his education in the military. But first, he obtained both his primary and secondary education at St. Francis Catholic Practicing School from 1956 – 1961. Mark later joined the Nigerian Military School Zaria from 1962 – 1966 and also acquired more (three years) military training in the Nigerian Defence Academy in Kaduna from 1966 – 1969. He was commissioned as a Second Lieutenant and became a Captain in 1971. The General also went ahead to further his education to high levels, attending such institutions as The College of Military Engineering, Poona; Military College of Telecommunication Engineering, 1971 – 1975; Command Staff College, Jaji, 1978 – 1979; National Defence University Washington DC, 1990 – 1991; Harvard University, Boston, 1991 – 1992. David Mark is married to Mrs. Helen Mark and the couple has two lovely children, a son “Tunde Jonathan Mark and a daughter “Anne David Mark.” He has been described as rather stern in profession and blunt with words, not minding whose ox is gored. Mark also enjoys hobbies such as Golf, Tennis, and Squash. He is a Christian in the Roman Catholic Church and is allegedly a low paid public servant all his life. It is also said that his hometown resident has a rooftop helipad. 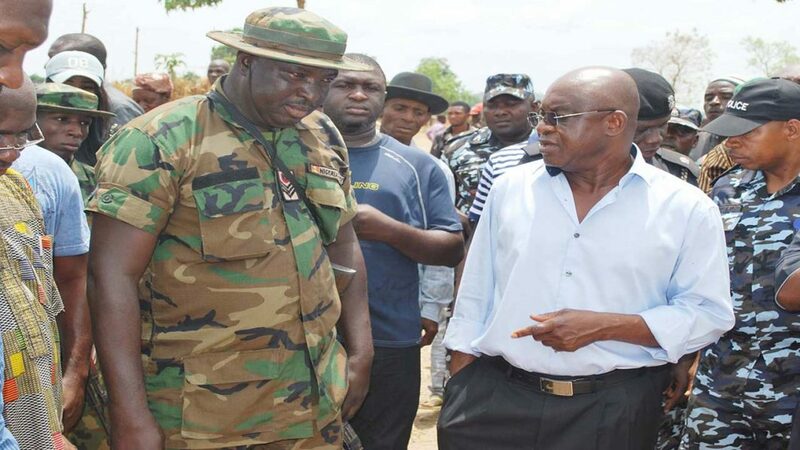 David Mark passed through some rigorous training in various military based institutions at his younger age which did well to earn him the title of Brigadier general in the Nigerian Army. Before gaining this title, he started off by attending military school in Zaria, moved to Nigerian Defence Academy in Kaduna to get some Military training, then in 1971, he moved up the ranks to be commissioned as a Second Lieutenant and became a Captain. To advance his studies and get more practical and useful theoretical knowledge, Mark decided to achieve this by going through institutions such as The College of Military Engineering, Poona; Military College of Telecommunication Engineering Command Staff College, National Defence the University in Washington DC. David Mark was the Commandant of Static Communications in 1974, and then later held a political post as a Chairman Abandoned Properties Implementation Committee in the Eastern region in 1976. Mark was also a Faculty Director, National War College; Commander, 3rd Marine Signal Division, Port Harcourt; Brigade Major, Signal Brigade, Lagos, Military Governor Niger State 1984 – 1986. David Mark headed the Communications Ministry and its two major parastatals: NITEL and NIPOST. During his time of service, Mark always expressed his intolerance for incompetent workers. He also proposed the death penalty for telecom cable thieves and a policy of dismantling under-utilized telecom facilities citing political considerations for giving allocations to towns with limited use of phone networks. David Mark was elected to his position as President of the Senate of Nigeria on June 6, 2007. He ran for re-election to the Senate for Benue South in April 2011 and was elected for a fourth term. When leading the review of the Constitution, Mark reportedly urged his colleagues to set aside their personal interests and focus on the interests of the Nigerian people. According to an interview granted by David mark’s son “Tunde,” he revealed that his father who happens to attend Catholic mass every weekday in the morning was initially supposed to be a priest but he opted out. Nevertheless, he makes up for it through his attendance at mass and support to the church financially. David has a number of things he does to cool off. Apart from traveling he enjoys playing golf and he does this as often as he can. According to vipfaq, David Mark’s net worth is estimated to be in the range of approximately $160 million as of 2018. This includes properties, stocks, and luxury goods such as yachts and private airplanes. David Mark is a very traditional man as he loves his Nigerian attires as well as Nigerian delicacies. Some of his favorite meals include; fresh palm wine, pounded yam and bushmeat and Melon seed soup (also known as Egusi soup). David can’t drink coffee because it gives him serious stomach upsets. As of his habit or a brand as you can say, he only writes with a red pen. This became a norm for him during his early days working as a directing staff at Command College, Jaji.